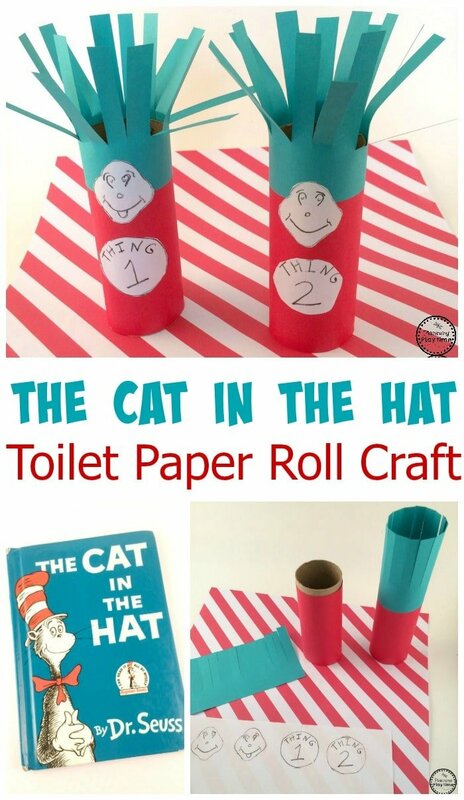 It’s Dr. Seuss week, and we have an super cool Cat in the Hat Toilet Paper Roll Craft to share with you today. 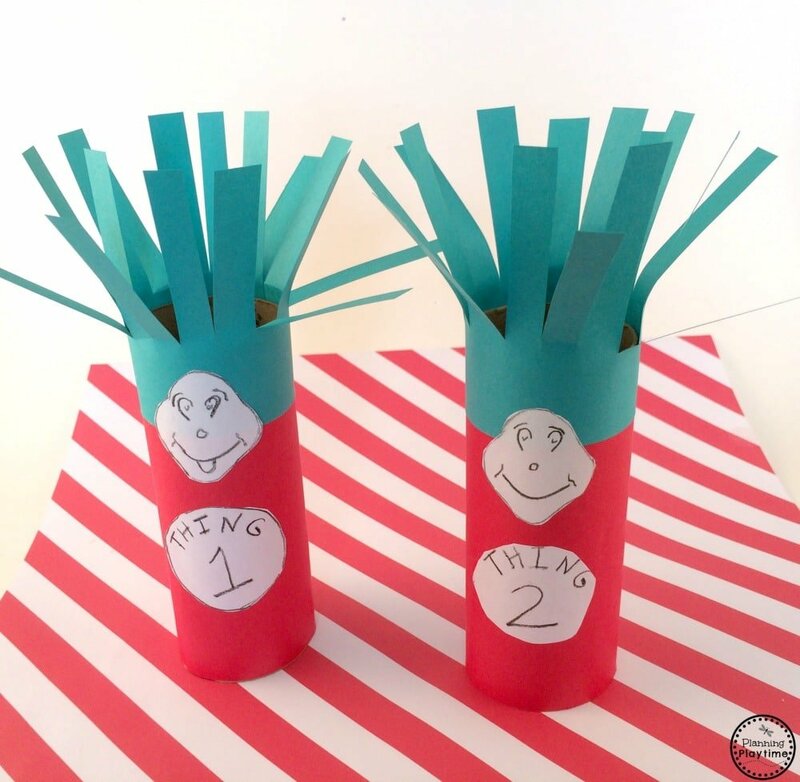 Two of our favorite characters from The Cat in the Hat are Thing 1 and Thing 2. In this craft, the kids get to each make their own set of the two little Things to take home with them. I have to admit, my favorite things about this craft is the hair. Isn’t it awesome! It’s so fun to play with too. My kids LOVED it! There may or may not be a secret drawer, in my house, stocked with empty toilet paper rolls. That is where we made our first stop. We used one TP roll for each thing. Next we hit the colored paper bin to get red and blue paper. You could paint the TP rolls red if you prefer, but it was fast and easy to wrap them in red paper. 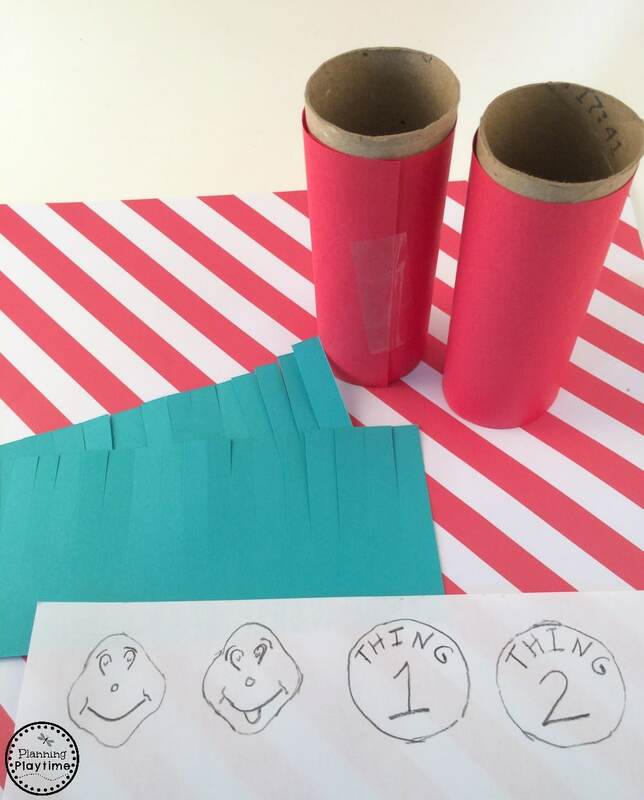 We cut red strips of paper to cover the toilet paper rolls. A simple piece of tape held the paper in place. Then we took strips of the blue paper, and cut slits all across the edge, leaving about an inch un-cut at the bottom. We then attached the uncut part to the top of the red covered toilet paper roll. The cut pieces became awesome Thing hair. The kids had the best time folding and bending the hair to give it some shape. Finally, our Thing 1 and Thing Two needed a face and their tummy badges from the Cat in the Hat book. I drew these out on a sheet of white paper. We cut them out and glued them in place. There you have it, the cutest little Thing 1 and Thing 2 a kid could hope for. 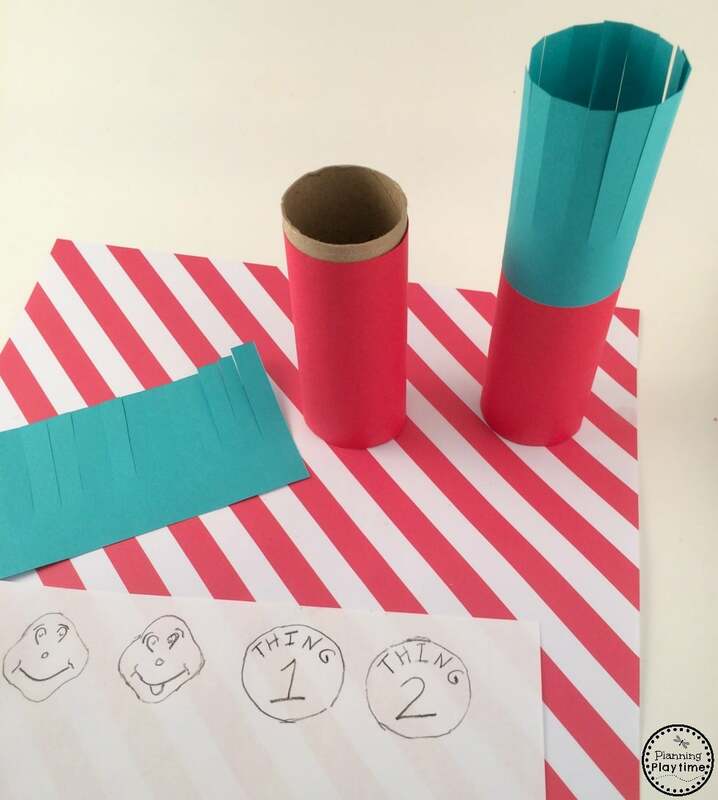 I love this Cat in the Hat toilet paper roll craft for Dr. Seuss week in kindergarten or preschool. 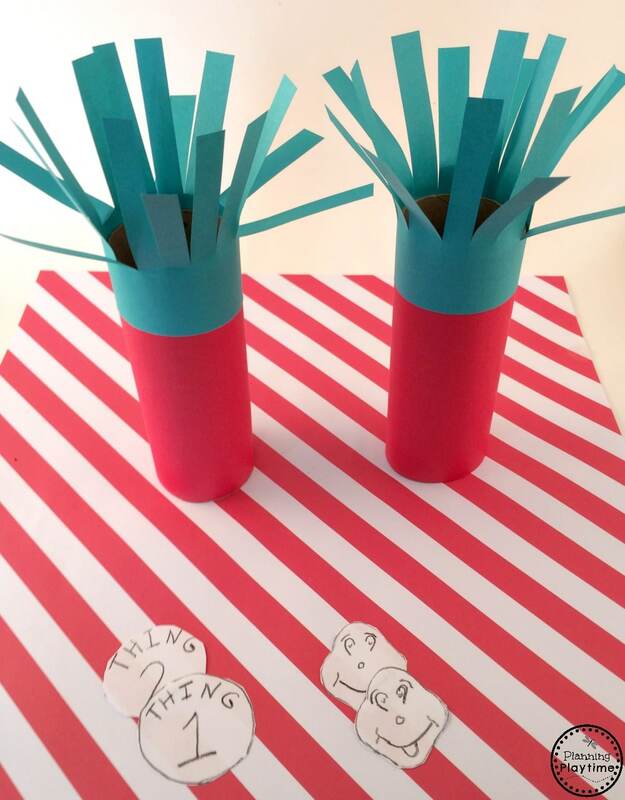 They are fun to make, fun to play with, and a great take home craft. 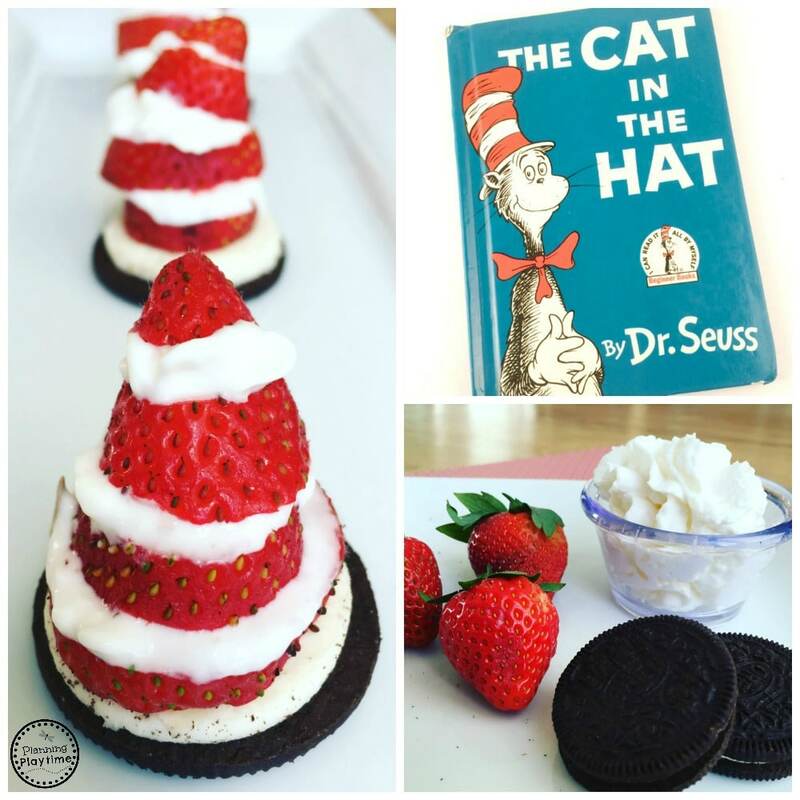 Looking for another great Cat in the Hat Activity? Check this out.